Since the 2010 release of Opening Doors, the first federal strategic plan to end and prevent homelessness, total homelessness in the US is now down 10 percent, from about 640,500 people in 2010 to 578,400 by 2014 according to HUD’s annual Point-in-Time (PIT) counts. This decline has been driven by a significant ramp-up in federal resources devoted to ending homelessness over the past decade. 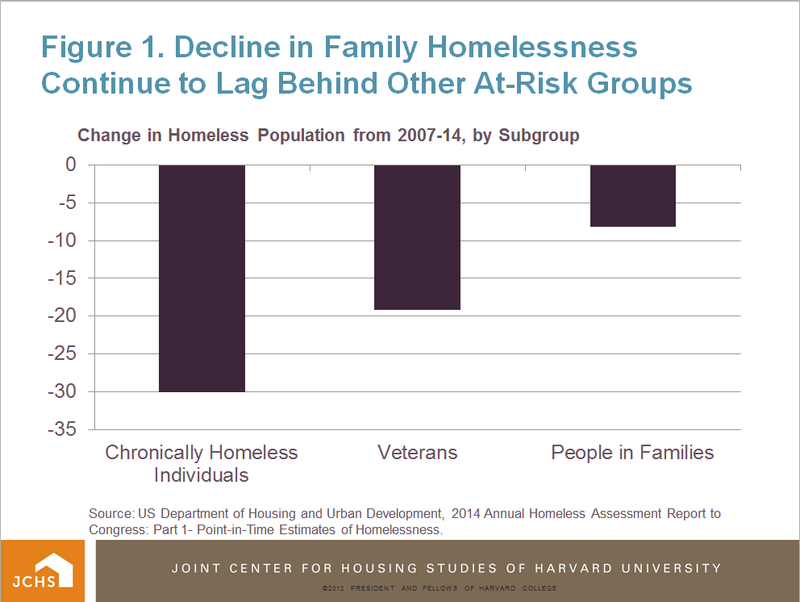 Although federal investment has resulted in substantial reductions in homelessness among at-risk groups such as veterans and individuals experiencing chronic homelessness, homelessness among families has persisted. According to HUD’s most recent PIT count, more than a third (37 percent) of the total homeless population in the US is made up of people in families, with children under the age of 18 accounting for nearly 60 percent of this group. 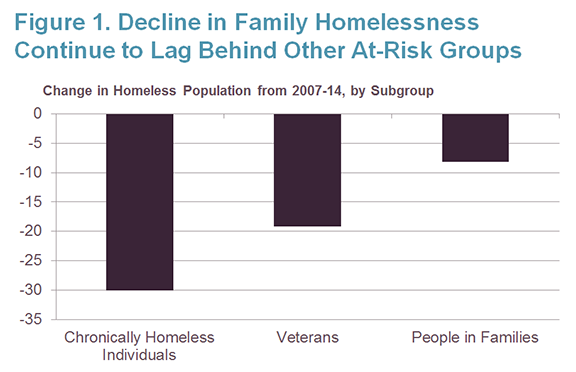 In fact, compared to other at-risk groups, homelessness among persons in families has declined at a much slower rate since 2007 (Figure 1). Source: US Department of Housing and Urban Development, 2014 Annual Homeless Assessment Report to Congress: Part 1- Point-in-Time Estimates of Homelessness. 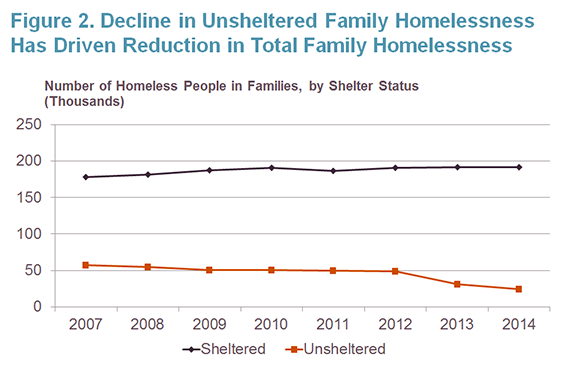 Most notably, much of the decline in family homelessness in recent years has occurred among the unsheltered population (those living on the streets, in abandoned buildings, vehicles or parks), while the number of sheltered homeless people in families (those living in emergency shelters, transitional housing programs, or safe havens) continues to rise steadily (Figure 2). Nearly nine in ten homeless people in families were staying in shelters in 2014. In New York City, where homelessness has reached historic proportions, the advocacy group Coalition for the Homeless estimates that homeless families make up the majority of homeless shelter residents and that the average number of homeless families in shelters rose by 67 percent between January 2005 and January 2015. Since the end of the recession, the affordable housing shortage has continued to play a major role in rising rates of family homelessness. Between 2010 and 2014, in high-cost locations where affordable rentals are in short supply, the number of homeless people in families increased substantially: by 50 percent in the District of Columbia, 41 percent in Massachusetts, and 22 percent in New York. The problem is acute in urban areas across the country. According to the 2014 US Conference of Mayors Hunger and Homelessness Survey, 83 percent of the 25 cities surveyed cited the lack of affordable housing as a leading cause of homelessness among families with children in cities in 2014, with over a third (39 percent) of the 25 survey cities reporting that they expected the number of homeless families to increase moderately in the coming year. Indeed, family homelessness remains concentrated in urban areas, with 45 percent of all homeless people in families living in major cities in 2014. Nearly 20 percent of homeless people in families in the US lived in New York City, which had the largest concentration of homeless people in families in the country (41,633) in 2014, followed by Los Angeles City and County in a distant second (6,229). The concentrations of homeless people in families in New York City and Los Angeles also reflect the rising market rents in these metro areas, which have forced a growing share of households to allocate higher shares of their monthly incomes to housing costs. In 2013, 32 percent of renters in the Los Angeles metro area and 30 percent of renters in the New York metro area spent more than 50 percent of their monthly household income on housing, according to the American Community Survey. The best housing and services interventions for assisting homeless families have been a matter of some debate. Because families typically do not face long-term episodes of homelessness—indeed, HUD’s PIT count found that just 7 percent of homeless people in families were chronically homeless in 2014—one strategy often touted as suitable for helping them has been rapid re-housing, which focuses on quickly moving families out of shelters into permanent housing through the use of short-term rental subsidies. According to the National Alliance to End Homelessness, about three-quarters of families entering shelter are able to exit quickly with little or no assistance and never return. However, results released from HUD’s Family Options study last month found that rapid re-housing was much less effective than a permanent housing subsidy, such as a housing choice voucher, in reducing shelter usage and improving housing stability of homeless families. Rapid re-housing may not work for all families, particularly those who are struggling with a host of long-term issues that may inhibit them from securing stable employment and achieving housing stability once their rental assistance expires. For homeless families that require more intensive psychosocial support, permanent supportive housing, which pairs affordable housing with supportive services in order to achieve long-term housing stability, may be a more appropriate strategy. Through on-site services, permanent supportive housing can address the often complex causes of homelessness among families, such as histories of domestic violence, mental illness, and substance abuse. Yet the current inventory of permanent supportive housing largely targets single adults, especially those with chronic patterns of homelessness. 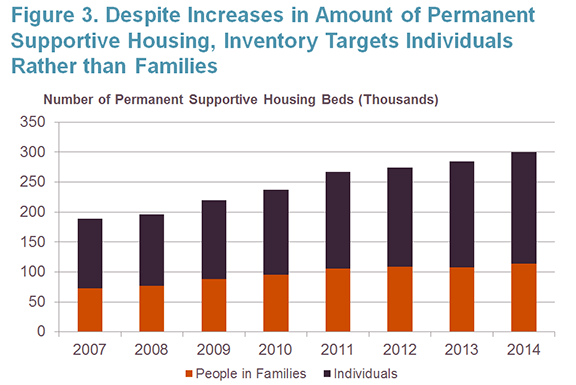 Although the number of permanent supportive housing beds has increased significantly since 2007, a substantial share of permanent supportive housing beds are set aside for individuals rather than families (Figure 3). 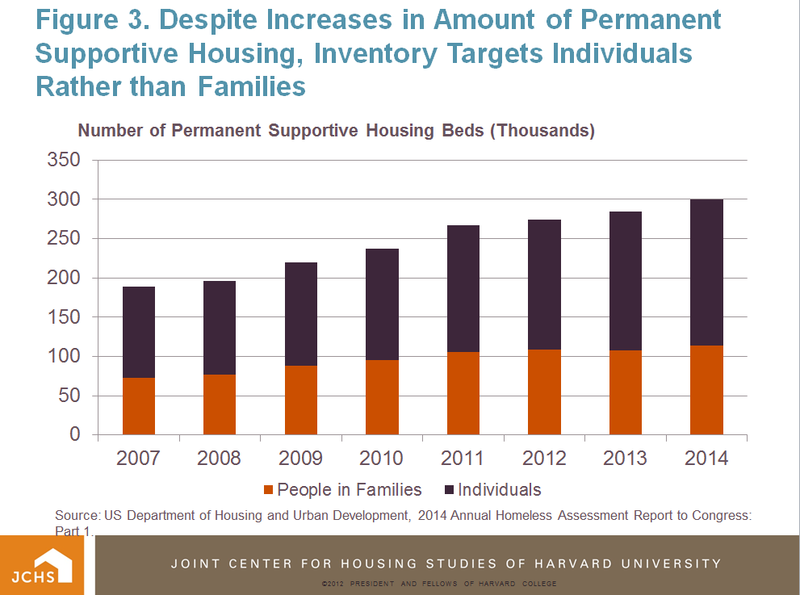 The limited availability of subsidies for the services component, as well as higher operating expenses compared to affordable housing, present challenges for expanding the supply of permanent supportive housing. However, given the rising number of homeless families, it is important for policymakers, local communities, and practitioners to collaborate on interventions that address the continuum of needs that homeless families face, whether they be in the form of short-term rental subsidies, a housing voucher or permanent supportive housing.